Found out that Pat Helland went back to Microsoft, and guess what. He is telling enterprise software developers they need to to be aware of power consumption. Most of you don't know Pat, but he is significant enough for Mary Jo Foley to blog his return back to Microsoft. Former (Microsoft) Platform Architect Pat Helland — who spent the past couple of years over at Amazon.com helping the company with its service-oriented-architecture (SOA) strategy — quietly rejoined Microsoft in early March <2007>. Here is Pat's blog entry about his 2 years at Amazon before his return to Microsoft. What about Amazon? I worked there almost two years and found it fascinating to see the amazing technology and super smart people creating that scalable and reliable web site. Amazon’s use of service oriented architecture is one of the world’s most advanced (if not THE most advanced). Watching the application of process, discipline, and organization to a rapidly evolving disconnected and yet connected business problem gave me a much deeper understanding of the challenges faced by all enterprises. It was my privilege to work with people across the entire development arm of the company and to focus in on the area of the product catalog, search, and buyability (i.e. who is allowed to buy a product from which merchant and at what price). This is service oriented architecture at its best. It was a great experience but I truly missed the opportunity to communicate more broadly through the industry and, frankly, decided that I missed Microsoft and its customers! Pat's presentation to 3,000 developers at a Nov 2007 TechEd event is his first public appearance back at Microsoft. 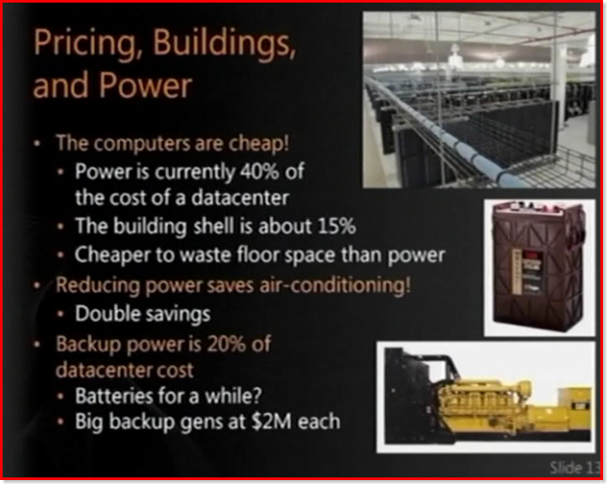 The below slide shows he is educating software developers on the cost of the data center power. I wonder how much of what he learned about power is from when he was at Amazon, because when I knew Pat at Microsoft he didn't talk about the power subject. Forward this presentation on to your software developers to help them to start thinking about power.